Monday will see an international team of scientists set sail for the mid-Atlantic on a quest to sample microbes living deep in the ocean floor. The expedition will use new types of rock drill developed in the UK and Germany to retrieve cores from up to 80m below the seabed. The target of interest is the Atlantis Massif, a 4km-high underwater mountain. Scientists say its rocks may hold clues to the origins of life on Earth and its potential on other planets and moons. The team is interested in the process of serpentinisation, which involves the alteration of material brought up from the mantle. This occurs along the mid-Atlantic Ridge - the rugged chain of formations stretching down the centre of the ocean, where new crust is being created. Rocks that contain iron- and magnesium-rich minerals (olivine) react with seawater to produce gases such as hydrogen and methane. And this chemistry can then drive the metabolism of simple organisms. "They can 'eat' hydrogen, they can eat methane, they can eat some of the smaller carbon compounds that are formed by the reaction of water with these rocks," explained expedition co-chief scientist Dr Beth Orcutt. "They get energy under those conditions to help them grow, and to form new cells," the researcher from the Bigelow Laboratory for Ocean Sciences in Maine, US, told BBC News. The Atlantis Massif is known to be an excellent location for studying this process. 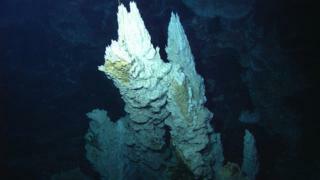 Back in 2000, an expedition stumbled across huge towers of carbonate on one side of the mountain. These pillars were precipitated in the hot, alkaline waters created by serpentinisation. Scientists have already sampled the biology around them, finding abundant single-celled microorganisms known as Archaea. They now want to drill into the nearby rock itself to see if different types of microbes persist and how exactly they function. Normally, this exercise would be run from a rig on a specially adapted ship. But the team is going to the massif on a standard research vessel. The UK-based RRS James Cook will deploy remote-controlled drill mechanisms, in what is a first for this type of expedition. These systems, which are about the size of a shipping container, will be lowered on to the underwater mountain by a winch. Once on the seabed, their weight will keep them steady. The machines carry a cartridge full of drill rods and core barrels that they add together to push tens of metres into the underlying rock. Sensors and sampling equipment can also be lowered into the hole to make a range of scientific measurements. "It is quite deep down - 750m to 1,750m below the sea surface," said Dr Carol Cotterill, a senior marine geophysicist with the British Geological Survey. "We have two remote drills: the BGS RD2 and the Marum Mebo drill. They're both big bits of kit. "They're attached by umbilicals, and each of them has cameras on them that send live feeds to the surface. "So, the minute these drills are deployed, the respective drill teams will rush to their container control rooms to start running operations." Researchers are fascinated by the process of serpentinisation because of what it could say about life's ability to thrive in even the most extreme circumstances. It has been posited that life on Earth may even have started in locations where upwelling rock from the mantle meets the ocean. And scientists who study the possibility of living things beyond our planet consider such processes to be among the most likely means to sustain biology elsewhere in the cosmos. Next Wednesday, the Cassini probe at Saturn will make an ultra-close flyby of the moon Enceladus. It will be trying to sample water jets spewing from the little world's south polar region. Mission scientists hope to be able to detect molecular hydrogen, which could be seen as a strong indicator that serpentinisation is taking place at the base of the global ocean suspected to lie under Enceladus's ice crust. "Wherever you have this general composition of rock and water, you could make hydrogen and methane. And some astrobiologists are hoping to send probes to look for methane and hydrogen in different places throughout the Solar System, including Mars," commented the Atlantis expedition's other co-chief scientist, Prof Gretchen Früh-Green from the Swiss Federal Institute of Technology in Zurich. Image caption Could serpentinisation be occurring on Enceladus, the moon of Saturn? Closer to home, researchers are also interested in the process of serpentinisation because it works to lock away the greenhouse gas carbon dioxide. The carbonate precipitations created at locations such as the Atlantis Massif are fed by the CO2 that has dissolved in seawater from the atmosphere. These deposits can stay stable for tens of millions, even hundreds of millions, of years. The $3.5m (£2.3m) Atlantis Massif expedition has been organized by ECORD, the European Consortium of Ocean Research Drilling, as part of the International Ocean Discovery Program (IODP). The use of the RRS James Cook is an in-kind contribution from the UK's Natural Environment Research Council.